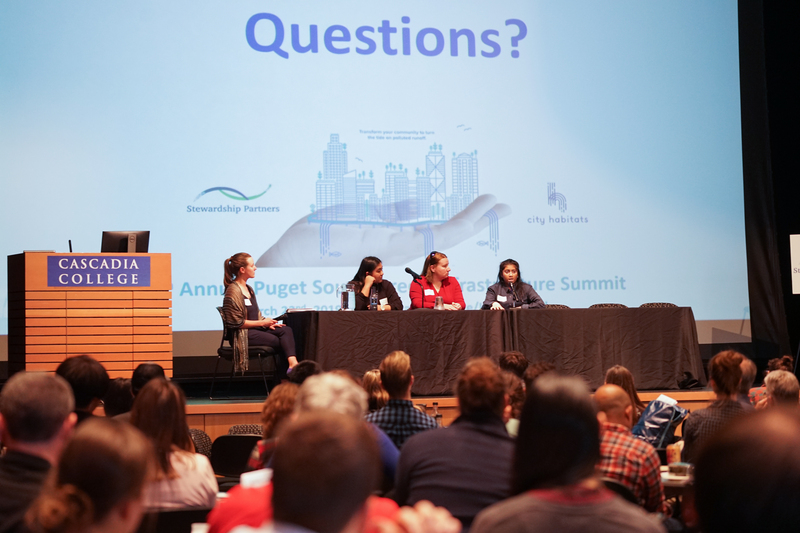 Mobius Hall at Cascadia College was overflowing with inspiration, collaborative energy and green infrastructure leaders from around the Puget Sound region during the 4th Annual Puget Sound Green Infrastructure Summit on March 22, 2019. Even after a snow delay, the summit was at capacity with over 250 people gathered to listen, learn and be challenged from the first presentation through the closing call to action. Bringing this group together for a City Habitats event was Stewardship Partners and a host committee that developed a program featuring opportunities for those in every sector and at every stage of their career to build connections and share about their work. It is not hard to convince those in the room that green infrastructure is a good idea. The challenge can come when collaborating with others on large scale projects aimed at balancing multiple priorities – and managing the funding and space that the project allows. Each of the morning panelists approached this from a different perspective, offering a chance for attendees and the panelists themselves to think about opportunities to bridge these different perspectives. 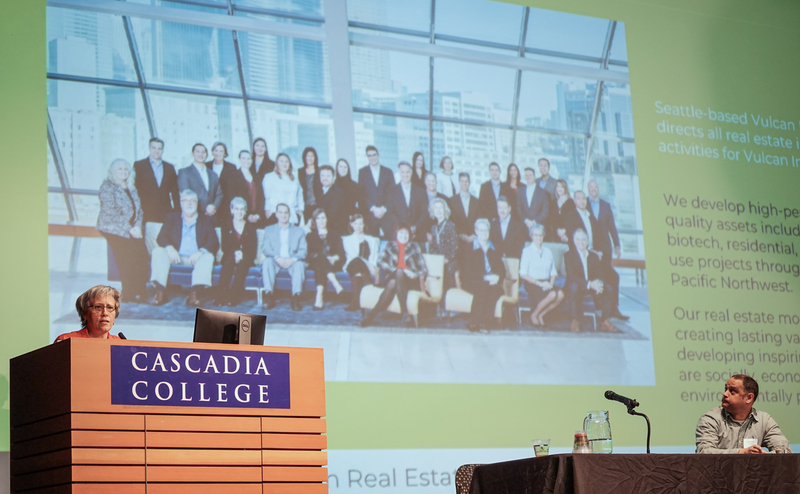 For Lori Mason Curran and Vulcan, a development company, the focus is on developing property that fits the clients needs and goes above and beyond for green infrastructure. Behind such innovative projects as the Swale on Yale, Vulcan is embracing the Salmon Safe certification in their development projects. This commitment to green infrastructure and environmental design is a thread that connects their projects – and has also led to significant success! The focus of Front and Centered is understanding and moving forward the priorities of the communities of color across Washington State, ensuring that investments to combat pollution and climate change are in the areas that are the most impacted. A new Environmental Justice mapping tool, highlighted by Sameer Ranade at the summit, will support organizations, agencies and others do just that. The Washington Environmental Health Disparities Map incorporates criteria prioritized by communities of color and frontline communities. A new piece of legislation, Healthy Environment for All (HEAL) Act, would call on agencies and lawmakers to incorporate the data from this mapping tool into decision making. 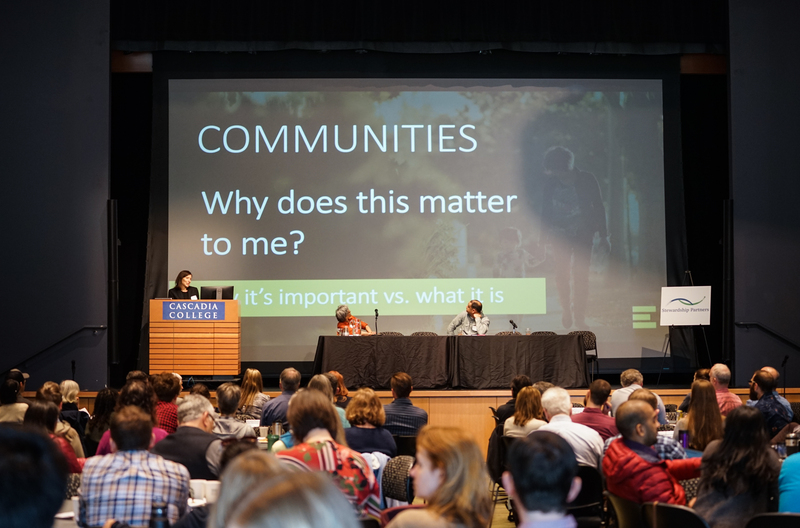 The challenge of balancing these different priorities was posed in a question at the end of the panel around the potential displacement of communities when green infrastructure was installed. While there is no magic solution, the panelists highlighted the importance of local hiring, incorporating affordable housing and other holistic decisions. When each of us think of leaders, youth and young people may not be the first people to come to mind. In the Puget Sound region, youth are taking the lead in speaking up for their communities and taking on environmental challenges. For the growing field of green infrastructure, it is essential to integrate these youth in shaping the future jobs so that they are accessible and reflective of their priorities. The afternoon panel featured three women that are actively using their voices to shape this field. Risa Suho, a senior at Kent-Meridian High School and a daughter of immigrants, is working to install green infrastructure at her high school in partnership with the RainWise program. Her story is a reminder of the importance of hands-on experiences for youth – rather than just simply classroom experiences. Hannah Price, a student at Cascadia College, shared about her journey as an adult returning to the classroom. She is excited about diving into this field when she graduates – but also reminded the audience that gender inequity continues to be real, from the types of careers women are encouraged to pursue to the pay they receive in those careers. For Shelina Lal, a Duwamish Valley Youth Corps mentor, the day was all about challenging those in the audience to take action – and not just respond with emotion to the stories of these young women. Her involvement in the Duwamish Valley Youth Corps shifted her life – tapping into her gifts in being an advocate for her community and a mentor to other youth in the neighborhood. Shelina credited the adults that supported her – and reminded everyone in the audience that more adults need to show up for youth. These panel discussions energized the room of attendees that came from across the region. At tables in the morning, during lunch and flowing out from the day, the attendees were ready to think differently about engagement and collaboration. While the summit is only one day, it provides a space for connection that yields efforts and work throughout the year. We hope to see you there next year!